I received some pictures by email the other day from one of my readers. She wanted to share her bathroom renovation pictures with me. I told her I wanted to share these on my blog and she was very excited. I told her I needed some information about her home. She wrote me back and said the house is 88 years old and it was her husband's for twenty five years before she met him in 1996. They both came from marriages that had ended in divorce many years before. They met on a blind date set up by his daughter. Isn't that romantic? When he bought the home it was in sad shape and he had already done a lot of work on it. They were married in 1999 on this farm. The house sits on thirteen acres. Every room downstairs had been updated more that once. They loved working on the house together. Then this story gets sad. He passed away on February 26 after being diagnosed with cancer on December 9, 2010. She was devastated. She had told him that she wanted to paint the kitchen and he thought she was nuts because it already looked fine, but she went ahead and painted this past spring. 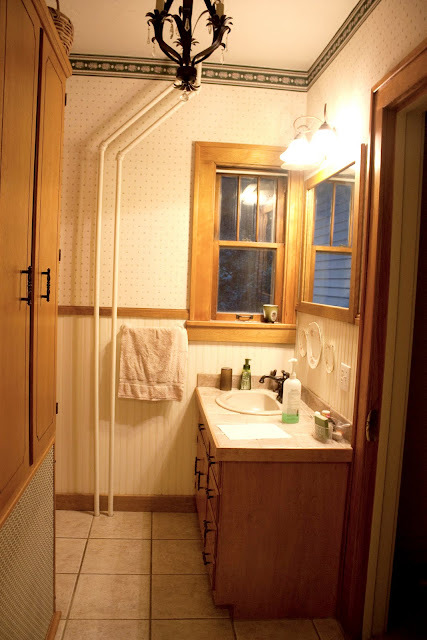 They had also talked about renovating the bathroom this summer so she went ahead with that, too. Her brother is a carpenter so he did the tiling and she did the painting and papering. All this was done on less than $3000 and it only took three weeks to complete. Here are some before and afters with the afters first. Love the wallpaper she chose. The two pipes are the water pipes since this is and older home. Didn't they do a good job? Paint, paper, new tile, and lighting sure did make a big difference. Thanks, Jo, for sharing this with us. If any of my readers without blogs want to share a makeover you can email me anytime. Jo, if your pictures look brighter it is because I did lighten them in photoscape. Lovely makeover, and poignant love story. She did a lovely job.. Hopefully she worked through her grief as she made the home something they both would have loved.. Please offer her my sincere condolences for her loss. I think it's wonderful that she continued on with the plans that she and her husband had made for their home. 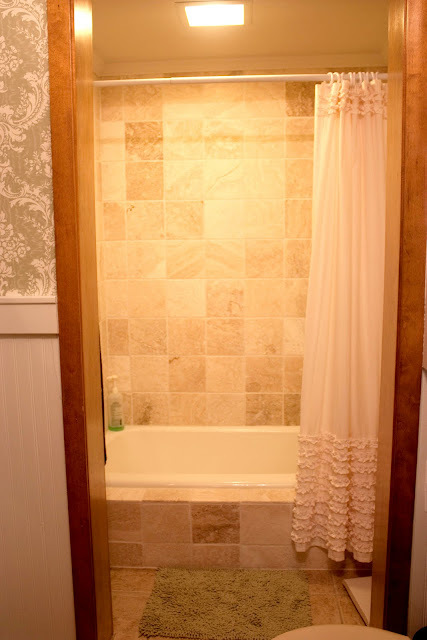 The bathroom redo is so pretty. Oh my goodness! Jo's bathroom turned out so pretty. I bet her husband is smiling down and proud of her. What a lovely bathroom! She did a great job! Wow, what a great makeover! I love the wallpaper too. It is amazing the difference wallpaper and paint can make! Very sweet love story and the make over is awesome. The pipes sure speak of a different time. *** I truly was thrilled for these folks when I read they "found" each other & true happiness, then to learn that death has parted them just made my throat get tight... Lord, that is sooooooo sad & makes one reeeally stop and think... and pray. Love her choice of wallpaper, & it makes ME happy to know that SHE'S happy with it all!!! She deserves it!!! Such a sweet/sad love story. The room turned out so pretty and no walls or mayor structures were changed. I know it must make her smile! I am so sorry to hear that cancer took another loved one. I pray she finds peace. She is very talented and driven. The makeover is lovely! Great job, I also love the wallpaper! Oh wow, her wallpaper is so pretty and that bathroom mirror is wonderful. Love it all, good for her! A terrific job! Tell her maybe she should start a blog. Would give her a whole new focus. 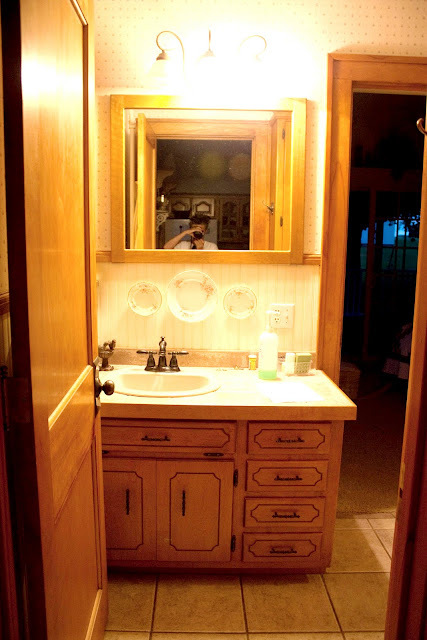 What a beautiful bathroom! She did a wonderful job. I am sorry for her loss. I hope that living in the place where they were married and shared so many memories brings her comfort. Oh Kim this was awesome, and thanks for sharing. So sorry for her loss. She has a lovely home to carry on, and that will always be a labor of true love. So sorry for the loss of her husband. The re-dos are just gorgeous, makes me want to do mine now. Thanks so much for sharing this! What a great makeover. I love the wallpaper. Sorry that she lost her husband so quickly. How great that they got to spend their time together working on the house that they loved. Sharing the love of an old house. She did a great job with the renovation. That wallpaper is so pretty. Thanks for sharing her lovely home with us, Kim. Oh, I'm so sorry to hear about this lady's husband but I'm sure the renovation probably helped her a little get through the pain of loss. 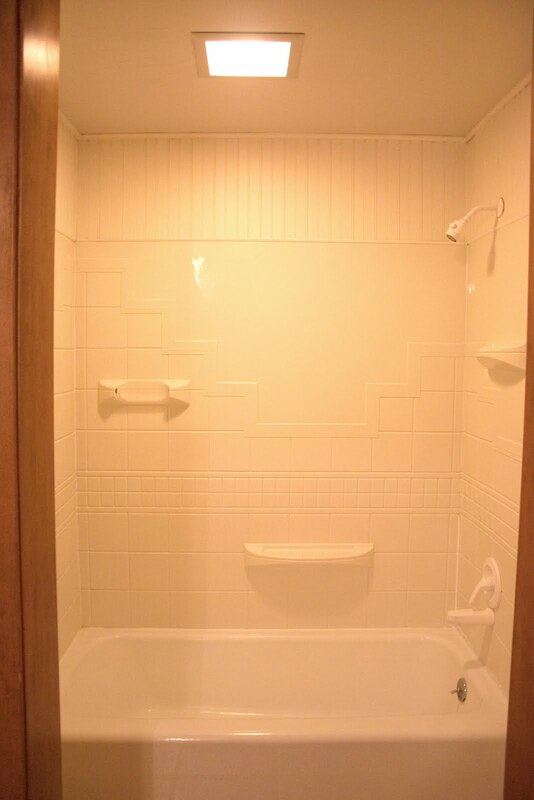 The bathroom looks wonderful. 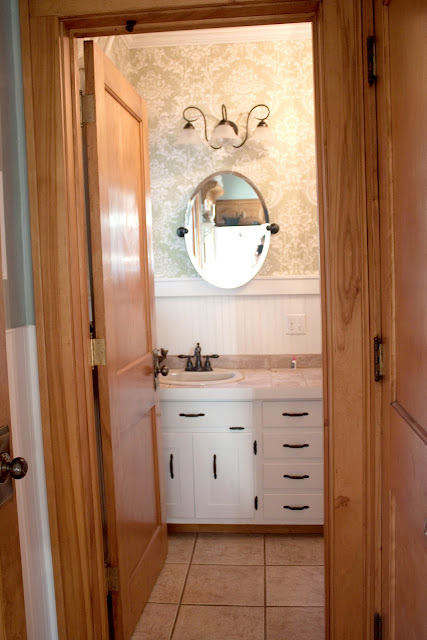 She did a wonderful job on this space...I love how cosmetic changes transform a space! Thanks for sharing this heartfelt story. She did a great job on the bath with such little money. What lovely makeovers! I love how you did the after photos first... I usually do the other way, but I prefer to see the pretty first! Don't miss my 100th post - an amazing inspired home! Beautiful makeover and heartfelt story. I'm sure he would've loved what she's done. Thanks for sharing. I actually said "Wow!" out loud, Kim! What a great job! 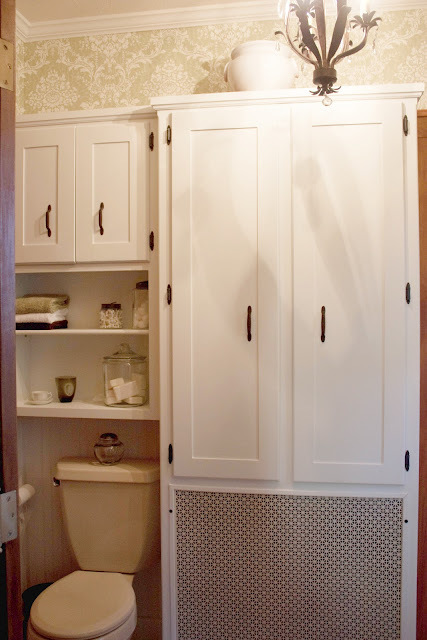 Love the wallpaper and the white made such a big difference on the cabinetry. Love the light fixtures, too! It looks gorgeous and what a sweet and very sad story! Oh wow! What a beautiful home and story. As others commented, I'm sure her beloved husband is smiling down and is so proud of her. Thanks for sharing Kim. Kim - thank you so very much for this beautiful blog. You did a great job with the photos. Thank you from the bottom of my heart to everyone who's commented and offered sympathy. I can tell you this is absolutely the worst thing I've ever gone through. It completely changes your life forever. I have a deep, abiding faith and I know that God is with me. I also know my dear husband is watching. Sometimes I can even hear him chuckle! If I do something that he's always done, I hear a very quiet little, "Good girl". Thank you all. Treasure those you love. What a beautiful job she has done on her home. Very pretty, indeed. Kim, She did a wonderful job on the remodel. This is such a heartfelt story and I loved the comment Jo left you above. 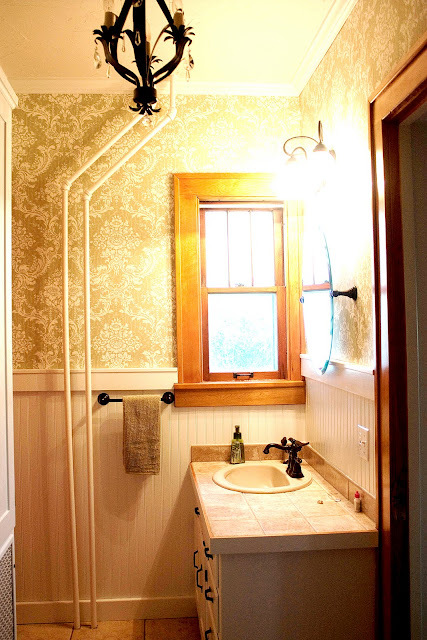 I love the wallpaper, tile and hardware she chose. She must find this a bright spot in her life after a huge loss. Keeping busy, planning and working is a great diversion too! What a great change! I LOVE the wall papar as well. It is fabulous! what a bittersweet story. is there any way to find out the name of the wallpaper she used? it's so pretty. they did a great job! I love the wallpaper she used. my heartfelt sympathy on the loss of her dear husband.... he would be so proud of her to see her work shown on your wonderful blog! if you go to this website you will find the paper. scroll down. they have several gorgeous papers. mine comes in various colors. it is the nicest wallpaper i've ever hung. just a few seconds in the water and the paste is wet. it becomes very slippery. i had to hold it with my fingernails but it goes up beautifully, dries wonderfully and looks great. you will not be disappointed. They did a beautiful job. 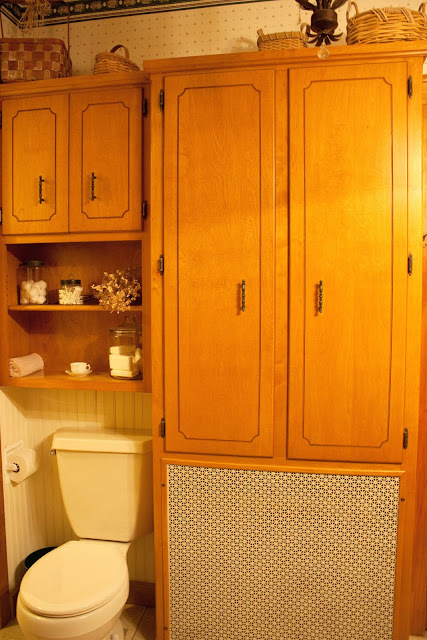 The cabinets look great and the wall paper she chose is very nice. She is very productive, despite her grief and I can only hope I could be that way too. Hugs to her and her family.